Genesis 4:1-15 is part of the last section of the “generations of the heavens and the earth” beginning in Genesis 2:4. Throughout this section, man moves from the perfection of Eden to an ever-increasing sinfulness, culminating in Lamech’s boast of killing a young man who had only struck him (Genesis 4:23-24). 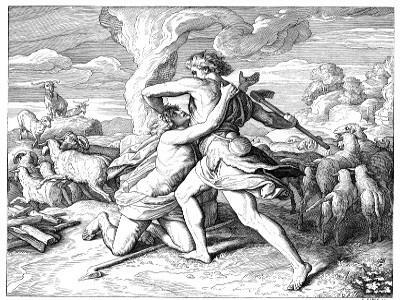 Cain murdering Abel, therefore, seems to be a confirmation that the curse of Adam has begun to spread to his descendents (Romans 5:12). There are a couple of difficult points here, however. First, the verb translated “gotten” can mean something more like “to acquire” or even “to buy.” It is a transactional verb, especially focusing on possession. It is related to the noun translated “livestock” in Genesis 4:20 and “possessor” or “creator” in Genesis 14:19, among others. However, this is a strange way of speaking, and Eve’s meaning is not entirely clear. Why would she say “I have taken possession” when speaking of a son? Second, the word translated “with the help of” here can be taken in a few different ways. The first, more common, is a word showing a direct object, sort of the like the “m” in the word “whom.” If taken this way, the sentence would read “I have acquired a man, the Lord,” which Luther famously used as proof that Eve was expecting the Messiah in the birth of Cain. Another, less common, but still well-established, is to translate it as “with,” which is how it is frequently translated here, even in the Septuagint. Luther’s interpretation, “I have gotten a man, the Lord,” may be too clever by half. First, it assumes that Eve names her second son Abel, which means “wind” or “vanity,” out of seeming cruelty. Cain is the Messiah, so Luther argues, and Abel is more or less dirt. This doesn’t jive well, however, with Eve’s grief in Genesis 4:25. It is just as likely that Eve’s joy in the birth of Cain has turned more reflective with the birth of Abel, causing her to say with the Preacher that “all is vanity and a striving after wind” (Ecclesiastes 1:14). There are certainly other examples of mothers naming children after their grief, such as Ichabod, that is, “where is the glory?” (1 Samuel 4:21) and Rachel wanting to name Benjamin Ben-oni, that is, “son of my sorrow” (Genesis 35:18). Second, it assumes that Eve has a fuller knowledge of revelation than she may in fact have. The Lord moves through history in a progressive way. He says to Moses that “by my name the Lord I did not make myself known to them” (Exodus 6:3). Jesus makes this clear as well when He says to the disciples: “I say to you that many prophets and righteous men desired to see what you see, and did not see it, and to hear what you hear, and did not hear it” (Matthew 13:17). God spoke through the prophets, but now He has spoken the fuller revelation through His Son (Hebrews 1:1-2). This hardly means that Eve did not believe or could not believe, but rather that revelation moves in stages, the impartial giving way to the fuller. Do we know all that can be known about the Last Day? “For now we see in a mirror, dimly, but then face to face. 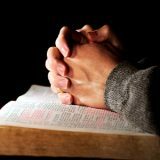 Now I know in part, but then I shall know just as I also am known” (1 Corinthians 13:12). What we are told clearly enough in the Bible is that Abel had faith while Cain did not. 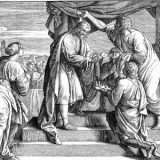 Abel’s blood is “righteous” (Matthew 23:35; Luke 11:50-51). “By faith Abel offered to God a more excellent sacrifice than Cain, through which he obtained witness that he was righteous, God testifying of his gifts; and through it he being dead still speaks” (Hebrews 11:4). “We should not be like Cain, who was of the evil one and murdered his brother. And why did he murder him? Because his own deeds were evil and his brother’s righteous” (1 John 3:12). Cain offers up a sacrifice to the Lord, but as Jesus warns: ““Not everyone who says to me, ‘Lord, Lord,’ will enter the kingdom of heaven, but the one who does the will of my Father who is in heaven” (Matthew 7:21). There may be something to the point that Cain offers grain while Abel offers an animal. Grain offerings in Leviticus are offered in thanksgiving (Leviticus 2). On the other hand, animal sacrifices offered with their blood are meant for atonement and forgiveness, for “without the shedding of blood there is no forgiveness of sins” (Hebrews 9:22). Is Cain attempting to skip over atonement and go directly to thanksgiving? However, the same word “offering” is used for both kinds of sacrifices here in Genesis, and the Bible is perfectly clear that faith is the key element. “For I desire steadfast love and not sacrifice, the knowledge of God rather than burnt offerings” (Hosea 6:6). It is an observation and cannot be made more certain than that. Three brief notes. First, even though Abel does not speak at any time, his blood cries to the Lord because of His faith. God will not forsake those who believe in Him. As Moses says of Israel in Egypt: “And God heard their groaning, and God remembered his covenant with Abraham, with Isaac, and with Jacob. God saw the people of Israel—and God knew” (Exodus 2:24-25). Second, though we are not told how Cain killed Abel, the earth opens its mouth to receive Abel’s spilled blood. This strongly suggests that Cain had some sort of killing object in his hand, which only intensifies his guilt and gives the avenger the undeniable right to strike him down (Numbers 35:16-21). Third, Cain’s cry that “my punishment is greater than I can bear” (Genesis 4:13) is not a cry of repentance, but a cry of fear. Job recognizes that God’s judgments are just (Job 1:21). It is the unbelieving heart which complains that the judgment is not in proportion to the sin (Ezekiel 18:25-29). Finally, Moses does not tell us what the “mark” placed upon Cain is. It is, on the one hand, a sign of mercy, because it effectively protects Cain from any avenger seeking his life. On the other hand, it is a physical sign of some kind, because it is placed “upon Cain.” The same word is frequently used of other signs, such as the sign of circumcision (Genesis 17:11). But with regard to Cain, it must be a sign of unbelief. God has set Cain apart from the rest of mankind, together with his descendents. If the mark was passed from generation to generation (though we are not told if it did), this would render the guilt of the sons of God marrying the daughters of men even greater, because God would have given them a physical sign of unbelief which they ignored (Genesis 6). Lamech certainly distorted the sign as a token of God’s favor, so that his sin became that much greater. Even if we have no such physical mark today distinguishing believers from unbelievers, those who walk after Cain are like goats and weeds, waiting for the Last Day when all will be revealed as clearly as the physical mark set upon Cain.